Then, I grabbed a few yard-stick stakes with posters stapled to them, my list of locations, and my keys and hit the road. There were signs for various candidates dotting many lawns and most intersections, this wasn’t just my big day, it was a lot of people’s. 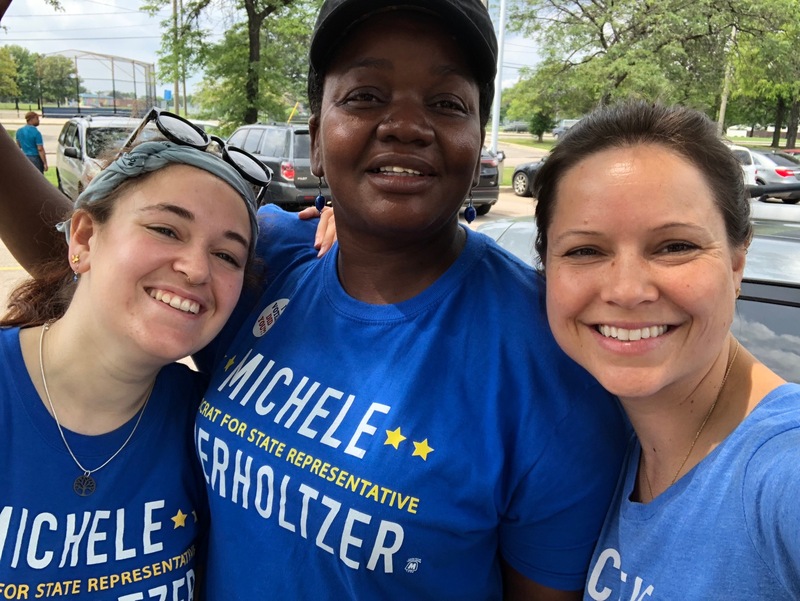 I stopped first at the Parking Lot of Gerry near the Fisher Building because he had called me very upset the day before saying that someone had stolen his Michele Oberholtzer sign and he thinks it’s a prime location. I agree. Then, off to the east side, to three different poll locations. I hammered down the stakes and hoped they would do something. At one stop, a man approached me as I got out of my car and asked for money. I had $20 in my wallet and I asked him if he would hand out literature if I paid him. He accepted, so then I set him up with a t-shirt, a stack of “vote for the advocate” cards, and a $20 bill. His name was PD and he called me later in the day to tell me he had faithfully done his duty. Back home, the house was waking up. More bodies, more people. Molly came stumbling down the stairs- about an hour later than she planned to wake up- and we just started cracking up at the sight of each other. What do you do next? This part is harder to remember. People came and went, I came and went. Sasha drove me because I was declared to be too tired to drive safely. We stopped by the Hamtramck polling locations. I wore a long skirt and shawl at the mosque and handed out the miniature cards that we’d made the night before. They said “Vote” in English, Arabic and Bengali on one side and, on the other side, a version of the ballot with “Democrat for State Representative” and my name underneath with a convenient oval for filling in. Jahangir arrived. He is an acquaintance I made through a man named Sodrul, who befriended me early in the door-knocking phase of the campaign and, for some reason, decided he really wanted me to win and was willing to help me do it. One day in May, Sodrul picked me up and took me to this neighborhood under the pretense of meeting voters. I had on the same skirt I wore today. We got out of the car and had a small council in the sidewalk with a bunch of men with orange beards, and, after very little time they said: “ok we will vote for you.” Then came the work. All of the basements in this neighborhood flooded every time it rained, they told me. Would I help? I had to think on my feet. We walked down the street, the men trailing me, and I saw that there were only two storm drains on the entire block. We talked about picking up litter to clear the drains, getting rainwater collection barrels, and getting the city to put in more storm drains. The story now goes that I solved the problem. 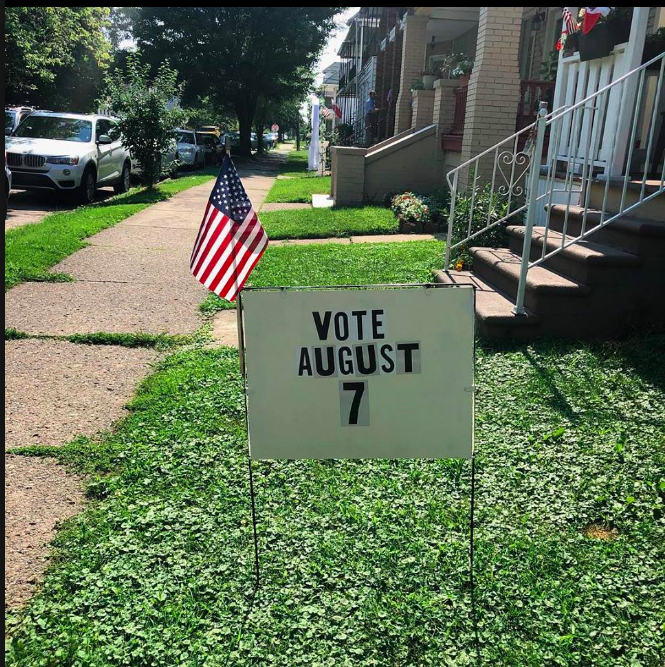 A month later, I returned to the same neighborhood to celebrate over Mountain Dew and put up a yard sign. This story transformed into legend at the homes of a hundred Bengali voters over the course of the election. Amidst a blur of Bengali words I heard “funny basement” and “helpful” mentioned over an over again, with a lift in the tone at the end of the sentence wherein “Michele the advocate” triumphed over encroaching floodwaters on behalf of the people. 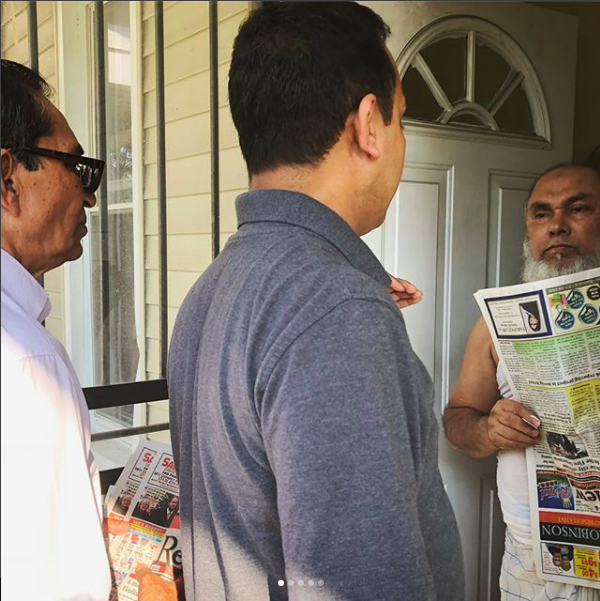 Anyway, Jehangir lives on that street and, despite the fact that his wife just had a baby about 3 days ago, he is here on election day to encourage people to vote for me. Shortly after he arrives, I depart. Sasha and I kept driving. We picked up some coffee. We hung out at the place where we would be voting later that day and tried to figure out when WE would vote. Molly was busy, she said go ahead and vote without her. I said no way. We chatted up voters and other candidates and other campaign volunteers and moved along. Back at home, we picked up some of the sack lunches that my mom and grandma had prepared late into the night and set off to deliver them to volunteers and check in on things. 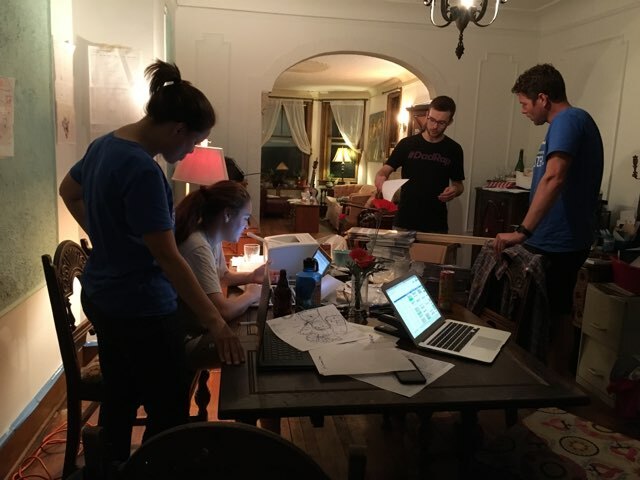 It was amazing to see the faces of people who were putting in time for my campaign and I didn’t even know it. Hi to Meghan. Hi to Nfr and the kids. Hi to Trina who called out to the other volunteers “That’s MY candidate! 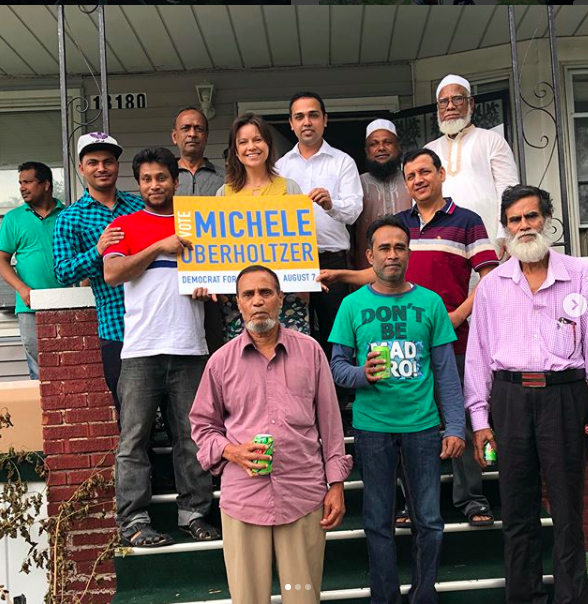 See how see came out here herself?” At the Hamtramck Senior Plaza, I saw Nikki who had learned how to say “vote” in Arabic and was shouting pleasantly at everyone. I saw Dianne McMillan and Jeff Nolish and Matt Friedrichs and Syed Rob and representatives for many other campaigns. Everyone was so nice to me, so happy to see me. One of the volunteers for another candidate saw me and said “Oh! I wish you had asked me first! 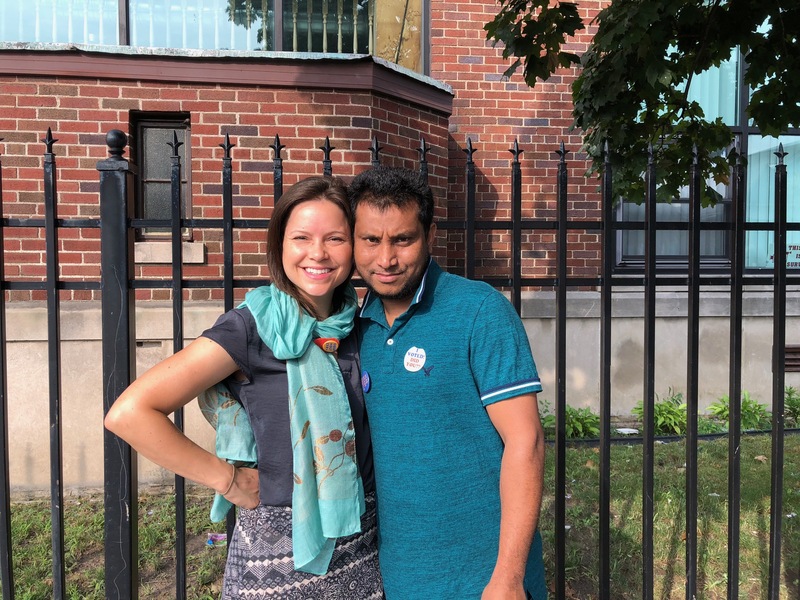 I would rather be out here for you!” I saw Abdelbaser, a client of mine at UCHC who has been through a lot of trouble to keep his home here in Hamtramck. He is an Egyptian immigrant with no income and very little English. I happened upon him the day before while knocking doors and after a quick reunion and a hug, he immediately set to work visiting his neighbors and turning out the vote. There he was at the polls, without even telling me he’d be there. I was overjoyed to see him. The voters came in slowly, I talked to a few. It was hard to know if I was helping. It was hard to know how to spend my time. Again at the house, I didn’t know what to do. 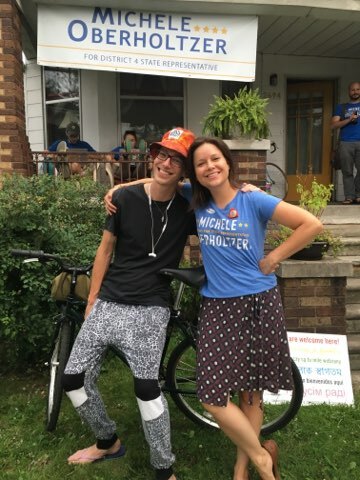 I prepared a map with all the newly registered Hamtramck voters and took off on my bike to knock a few last doors. It was extremely hot. No one was home. The people who were home had already voted. I gave up on that plan. 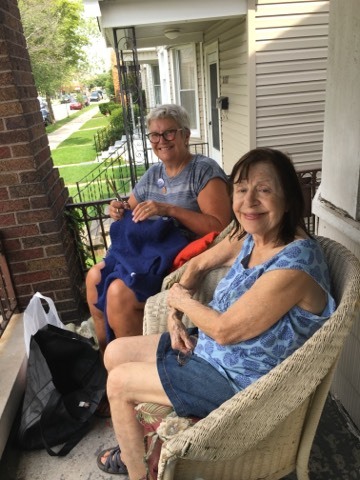 On the front porch of my house, there was my grandma and Marion, who was busy cutting sweaters into hearts. There were colorful bits of sweater shrapnel everywhere. Pizzas arrived, special delivery from Molly’s parents all the way over in New Jersey. 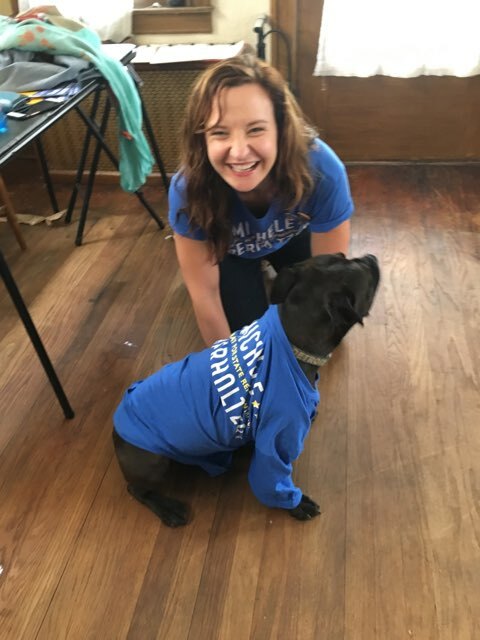 Molly became my campaign manager just weeks after graduating from University of Michigan. First there was Lane, my roommate, who stepped in as manager after her Americorp job ended and stayed on for months even though it was somewhat miserable for her. She got her dream job with Delta, and left abruptly and I didn’t fill the gap immediately. We recruited Dennis as a field manager, to help with voter outreach. I thought that was more important that the general stuff anyway and it was the part I didn’t know how to do. That was a constant struggle with him, but he had a politically active friend, Patti, who turned out to be a neighbor. She was looking for a better job and her dream job was to be a campaign manager. Alright then! Well, that didn’t work out very well and she quit shortly thereafter. I let Dennis go too, and it was a little bit scary there for awhile. Just about at this time, classes were letting out and my friend Margo sent a mass email to everyone at the UofM school of social work- a job posting for a campaign manager. Someone saw it, forwarded it to her girlfriend, who turned out to be Molly. It was pretty instantaneous that Molly jumped on board and became the keystone to the campaign. She was smart, easy to work with, very dedicated, and she got it. It made the whole debacle worth it because she wouldn’t have been available any sooner anyway. Back out to the polls. I drove alone this time. Trying to figure out where I was needed and how to bolster the troops. I handed out hearts everywhere I went. People loved them. They asked for more. I went to the projects on the west side of Hamtramck and walked up and down the sidewalks to talk to people. Almost everyone had already voted, but the people who hadn’t voted said they weren’t going to. I said “It’s a half a block away! It will literally never be easier! Do you remember TRUMP? This is the first big election since he became president! If we can’t show up now, when will we?” I think I got a few votes that way. I got back in the car and responded to texts from Molly and Evan, dispatching me to different locations. I wanted to see my friend Adam, my sister, Jessica, and my ex-boyfriend, Jeff. But first I had to go to the places where others were not. 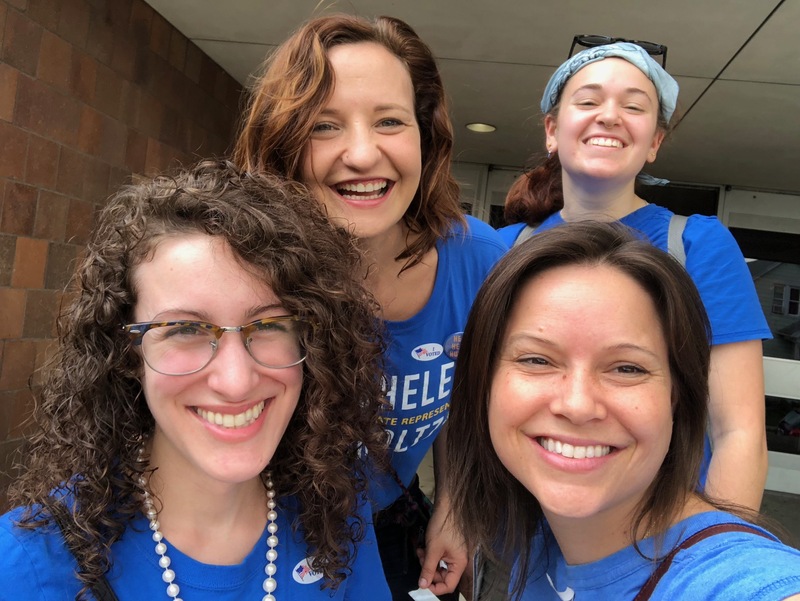 At one polling place, I stood outside awhile and befriended a supporter of Rashida Tlaib, and she was eager to support me too. I gave her a stack of extra fliers to hand out and left. I never got to the “good luck” part, because, at that moment, she launched an attack on me starting with repeating the question “are you a Socialist?” In the end, she wanted to know why I would accept a donation from someone who worked for Quicken Loans if I claim to be a socialist. In reflecting on this later, I’ll admit it did not even occur to me as a possibility to reject the donation, I met the man who gave it during a volunteer event filling out paperwork to help people save their homes from foreclosure, he was impressed with my work and later donated, when he found out I was running for office. I didn’t see this as compromising my integrity, but Rose Mary did. She shouted that I took money from Quicken Loans (not true), then that the person who donated was an executive (also not true), and never really allowed me to answer the question she was asking. I honestly don’t remember exactly how that conversation ended. It was such a bizarre and unexpected experience that I lost the rest of the memory. I do know that I kept my cool throughout her tantrum, which I was proud of, and that I was extremely shaken up afterward. I saw Isaac out of the corner of my eye but, after that, I wasn’t in the mood for cordial greetings, I left to the next spot. Finally, we were getting close to the time when the polls closed. I drove to where Jeff had been posted for most of the day. Jeff and I dated many times, many years ago, and we’ve kept in touch as friends. He’s been helping me out almost all day, every day, in this past week, so he feels like a big part of the campaign, though only at the very end. I’ve been noticing, with some surprise, how much I want to spend time with him. Jeff is sunburned from a day at the polls, but smiling. He happens to be sitting next to my good friend, Raquel, who is supporting Rashida’s campaign. She and I go inside the polls to get a tally of votes cast so we can check against numbers later in the night, if need be. We talk about the lack of women in politics, how hard it is to keep up with the political career path if at any point you decide to have a child. Then she tells me that Jeff and I would make cute babies. I talk to some voters. Here comes a beautiful older couple with matching yellow suit and dress- their Sunday best for casting votes. I see the piece of sidewalk art that my friend Ryan made for me earlier in the day “Vote for Michele Oberholtzer” it says, in colored chalk. The minutes pass. 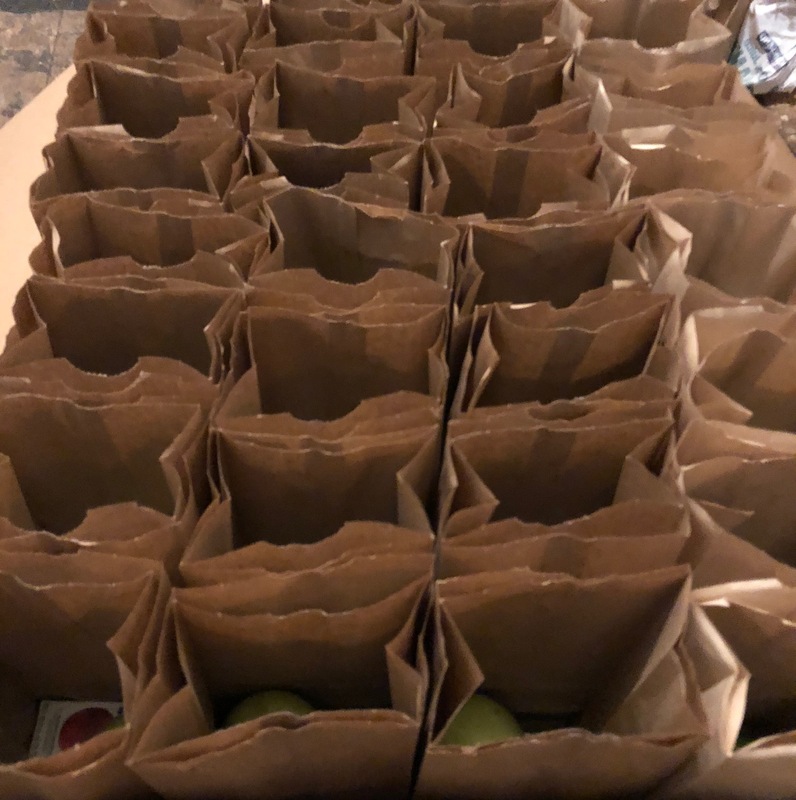 I feel sick from eating the junk food that I was supposed to be handing out to volunteers and tired from this day and the night that’s to come and the absurdly strenuous days and weeks and months that have led to this moment. I feel a sense of peace that I’ve enjoyed all day- whatever will be, will be, nothing I can do today is going to change the outcome so just ride it out. At 7:00, it was time to go. 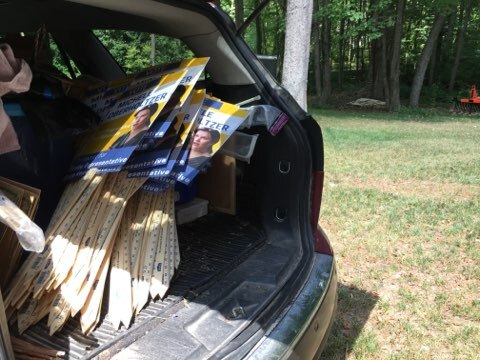 I picked up a few yard signs, and fantasized about driving to belle isle and taking a swim in the river, but I knew my house was full of people waiting to see if we had succeeded in our goal, so I steered my car toward campaign headquarters- home. There were people on the porch, there were people inside, there were people in the backyard. 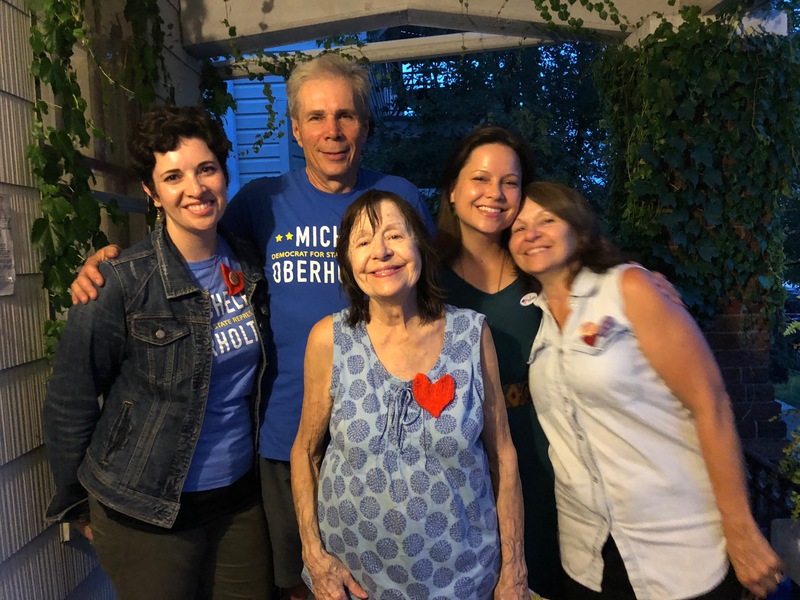 Almost all of them wore blue “Michele Oberholtzer” shirts. The house was cleaned and decorated and filled with great food, thanks, mostly, to Shirley. Shirley has helped with the campaign for months. She has been an incredible volunteer, making phone calls, putting out flyers, helping with events. She is one of my favorite clients from UCHC,. 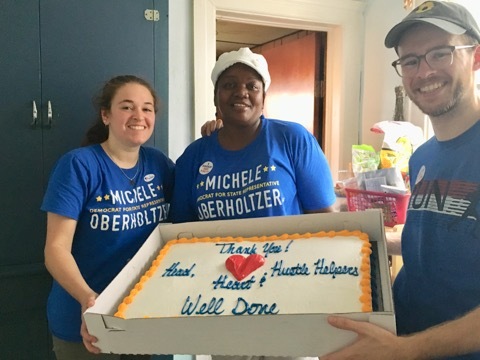 We helped her and her husband buy their home last year, and she just finished paying off the house with the money we were able to pay her from the campaign. How incredible. Shirley has become my Detroit Mom and my Detroit Dad, Ted (who is also my boss at UCHC) is manning the grill in the backyard. So much happening! I have done nothing whatsoever to host this party in my own home! I snuck upstairs to shower and have a moment to myself. Downstairs, there was a cluster of people huddled around laptops as they watched the initial results come in. No one told me what they say and I didn’t ask. More friends gather. We take pictures and share hugs. 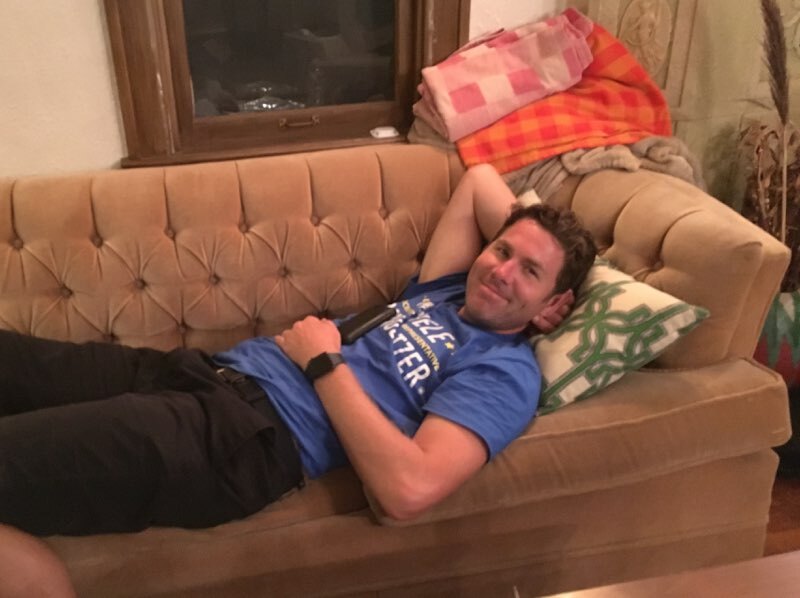 In the living room, a small crowd circles the room on couches and chairs and I ask everyone what was their favorite memory of the day. This unleashes a series of amazing stories from the different volunteers, who talk about their tactics recruiting voters (Nfr decorated her car and had her kids dressed up in artfully doctored Michele t-shirts and tell voters “She saved my house!”, Ebony would triangulate people in the parking lot as they emerged from my car and approach them before they reached the font lines of vote hustlers and list of everything I had and would accomplish until the volunteers for other campaigns lamely handed on their candidate’s fliers and said “I don’t really know what he’s done, I’m just here to pass this out.”; other people shared memories of voters who said “Oh yeah! I’m already voting for her!” or, better yet “I just voted for Michele!”). At one point, I stole a look at my phone (which I had been deliberately avoiding) and saw that I had dozens of texts, including congratulations. There on the Secretary of State website, my name was listed on top of the list of 14 candidates in my race. I was winning! But the result count was very low and I knew that it was far from a sure thing. Still, in that moment I knew I could win and it felt very, very good. A surprise! Little Alina and her family visited. She stole my heart after I helped her traverse her lawn in roller-skates a few months ago. I used a photo of the two of us on some campaign literature and she has been completely infatuated with me ever since. She sat on my lap and I explained the job I was trying to get and how I needed a bunch of other people to know that I wanted that job and to find out who I am and to show up at a certain place on a certain day and fill in the circle next to my name, and that I needed more people to fill in circles next to my name than any of the other names on the list. Time passed. The secretary of state website was crashing, showing results for 60% of precincts reporting, then reverting to 30%. Still I was on the top, but only by a margin of 8 votes. I went upstairs and wrote a reflection to try to capture that moment of anticipation and uncertainty in time. In my heart, I thought I would win. Downstairs, everyone gathered in the backyard. It was time for speeches. The results weren’t final and they wouldn’t be for many hours to come, so we couldn’t wait. This is where my memory of the details get fuzzy, which is sad in so many ways because I remember that everyone who stood up said something that melted my heart and filled me with gratitude and joy. I registered that this was one of the best moments of my life. 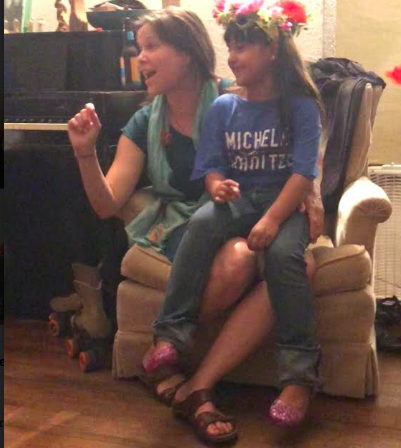 My sister Jessica spoke, my mom spoke, Molly spoke, Alina gave a speech that no one will ever forget (“I wanted her to be my best friend and now we ARE best friends and I don’t even know how it happened!”) Then, I spoke. It was so beautiful. That much I remember. Through the night, people filtered out. The data shifted and it started to show that Saad Almasmari was winning. We killed time by drinking and playing games. We sat on the porch. Jessica sang a song for me. We waited. I was in the house at 4am with everyone else on the porch when Jessica came in and told me “Michele, the results are in, it looks like they’re final. It’s not what we wanted.” So, it was over. Isaac Robinson, son of the woman who a few hours ago had yelled at me, had won handily with a strong showing of absentee votes. It wasn’t even very close, which, is a blessing in a way because I didn’t have to question it. There was bewilderment, acceptance, hugs, sleepy sadness. I went up to bed with Jeff and a pile of thank-you cards that the guests had all written for me. I read them and cried and fell asleep. In the end, I was the 3rd out of 14 candidates. I nearly tied for second to Saad, and handily beat the other first-time candidates. It was a shock to see that I had outpaced Rico Razo by such a large margin. The person who I thought was my biggest opponent was not. Someone I underestimated beat me handily. So it goes. I suffered through a few days of extreme exhaustion and ricocheting ambition. I picked up yard signs, wrote thank you cards, tried to sleep, went back to work too soon and took time off. I remember one day, about a month ago, on my way to work. The turn signal was blinking, I merged right into the exit lane, and took the rounded left turn toward the office, past the Motor City Casino, which I have never and will never go to and this question popped into my head: what will happen to me if I win the first campaign I ever run? I was afraid of the ego, the pride, the expectation that might creep into my head and heart if I won from the very start. I wanted to win, I really did, but a part of me knew there would be costs to winning, and benefits to losing. So I go with that. I get to stay in the space with all of the beautiful community that I’ve built instead of driving to Lansing. 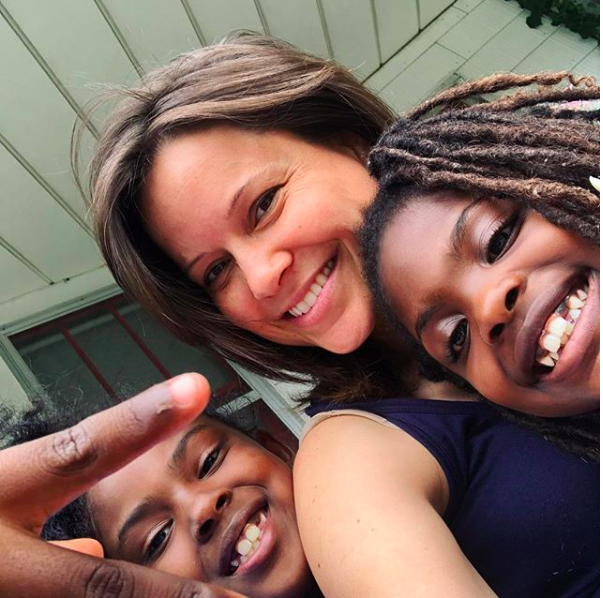 I get to continue my rewarding amazing work here in Detroit. I get to be proud of what I did and deeply grateful to everyone who was part of it.